I've had my new winter commuting bike, the Genesis Day One Alfine, for a week now so though I'd let you know how I'm getting on with it. Apart from a few niggles setting it up after unboxing it, the bike has been great. The supplied double-sided SPD pedals come with a removable flat pedal cover so you can use normal shoes. The ride from the steel frame is smooth. The drive-train is silent. The gear ratios are spot on for my commute and the top gear is higher than I expected it to be. The metallic orange paint is very nice. It takes a little getting used to the gear levers as you sweep for up and click for down, which is the opposite way round to dérailleur gears. The only negative comments I'd give is that there definitely isn't enough clearance for mudguards on the front fork with the 35c tyres that are fitted. The saddle is also a little too hard for my liking. It shouldn't be too much of a problem seeing as the single biggest distance I expect to do on this bike for the time being is 10 miles. what pedals are you referring to with the removable panel? sorry meant to say .. impressed with all you are doing! The pedals are Shimano M505 that come fitted with Shimano SMPD22 pedal reflectors to make them legal in the UK (http://goo.gl/jNMWY). This makes them usable as normal pedals. Hi, really impressed with your progress and cycling. 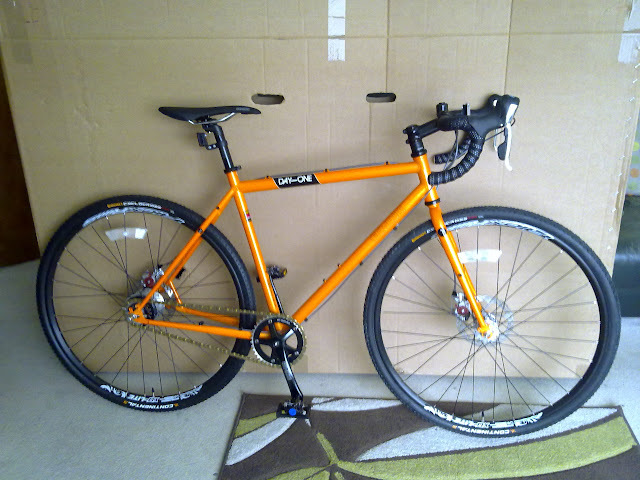 I have this bike on my shortlist, just trying to figure out mudguards, do you use them at all on it? Hi Stuart. Thanks for your comments. I haven't fitted mudguards yet as it's impossible to get front ones to fit with the 35c tyres. Once I replace the tyres I can fit some as it'd be a waste replacing the tyres before they're worn out. I bought a day one in last summer off ebay for£500. I changed the tektro brakes to avId bb7's and put conti 700 x 28 gatorskins on. I also fitted Zefal swan/croozer mudguards. The croozers rubbish, but the swan is brilliant for keeping your back clean. My last addition was a selle italia elite saddle. I love riding this bike, more than my trek madone. The perfect winter hack.